Make history come alive to your students! When you compare American History with that of other countries it might appear as though America is but an "infant". Our country has existed for just over two hundred years, which seems pretty microscopic next to China and Greece who date back to thousands of years B.C.E. Yet, even though America is so young in the scheme of world history, so much has happened! 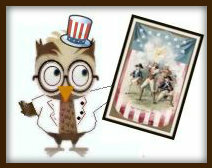 Any American, young or old who studies American History can't help but swell with patriotic pride. America has stood its ground against world bullies, has helped its friends in need, has contributed to some of the world's most important inventions, and has held fast to its founding fathers' principles of democracy and freedom. Of course, in every country's history there are going to be dark moments. It's important for students to understand that while America is the greatest country in the world, it is also guilty of grave misdeeds. The enslavement of Africans and the internment of Japanese Americans are just two examples of the stains on the fabric of our history which cannot be erased. What we can do is study these events and learn from them so that future mistakes can be avoided. After all, isn't that what being human is all about? Imperfection. Mistakes. What matters is that we learn from our mistakes and do better. And nations throughout the world are simply representatives of humanity. The following units of study all contain worksheets, assignments, projects, study guides, tests, and ideas to help you bring your history class to life. Every unit also contains at least one PowerPoint presentation for you to teach with. The first four resource-packed units are absolutely free and ready to download and print. However, because of the amount of work and care that goes into creating these resources, units beginning with Ancient India can be ordered from our Custom Created page. The following units all contain a bit of background information to get teachers started. Printable worksheets, handouts, various assignments, classroom activities, hands on projects, study guides, and tests are all available for easy download and printing. In addition, almost all units contain at least one free PowerPoint presentation to use in the classroom. Most importantly, remember to have fun when you teach American History. Convey your enthusiasm to your students and teach with creativity! Don't forget: If you don't see a particular unit you want to teach, place an order with us here and we'll custom-create it for you! Unit 10: The Wild, Wild West!